July is nearly through, which means it’s almost time for the Edinburgh Fringe! 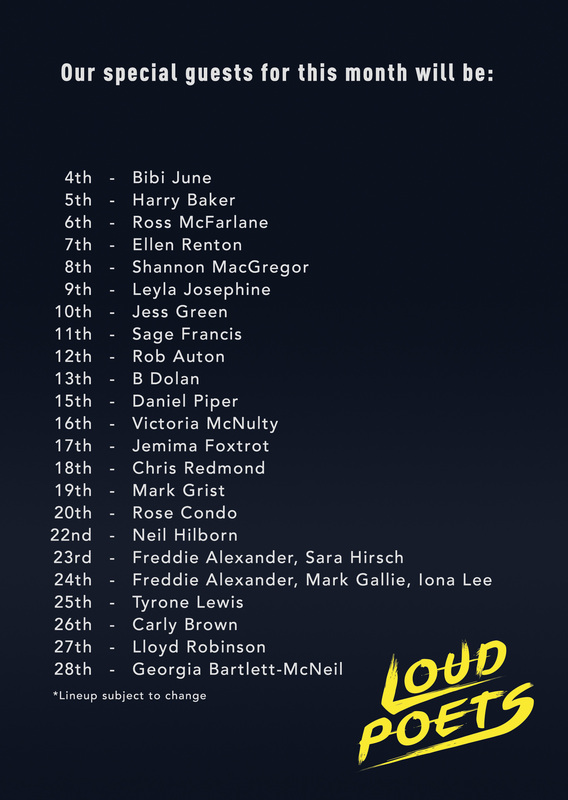 I’m delighted to be performing again this year as part of the core cast of Loud Poets. We’ve worked hard to craft a brand new show featuring spoken word poetry in a range of styles accompanied by live music from our band Ekobirds and stunning visuals created by our videographer Perry Jonsson. This year’s show takes our usual showcase format and adds a thematic twist… we’re very excited to share it with you. The show runs August 4-28 (not 14 or 21) at the Scottish Storytelling Centre. Tickets and more information can be found through this link. I’m also looking forward to performing on a few other stages this Fringe. On August 12 I’ll be chairing an Edinburgh International Book Festival event with acclaimed poet and prose writer Fiona Sampson. Later that evening (in quite a tone shift!) I’ll be competing in the riotous Anti-Slam! I’ll also be featuring at Boomerang Club on August 22, and returning as a guest to the Other Voices Cabaret (date TBA).